Ok, I know everyone knows how to make buttercream roses. I usually dread them, since they look perfect…until I have to remove them from the nail. The toothpick trick doesn’t work for me either. Bummer, right? WRONG! I freeze them! Yup, I whip out a rose, pop it in the freezer for a few minutes, and PRESTO! 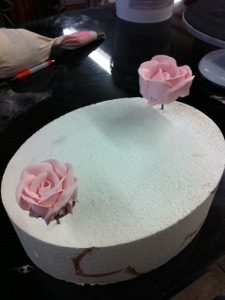 A rose you can handle (quickly) and just stick on your cake! 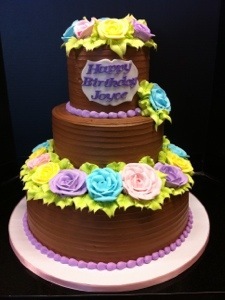 This works great for a cascade of buttercream roses! The finished result! Try it! When to cut the cake?! A cake is a cake of course, of course!